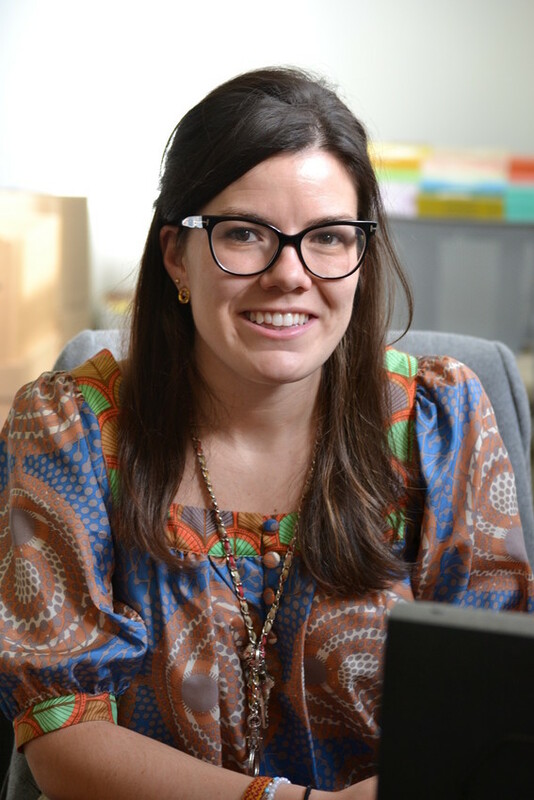 Falvey Memorial Library :: Where is Nova now? 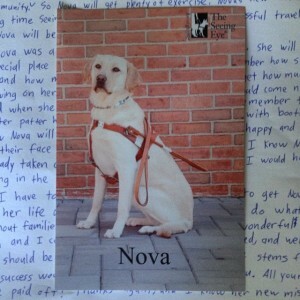 Last fall, while still new to Villanova, I wrote my very first blog post about Nova, the dog I was raising for The Seeing Eye. 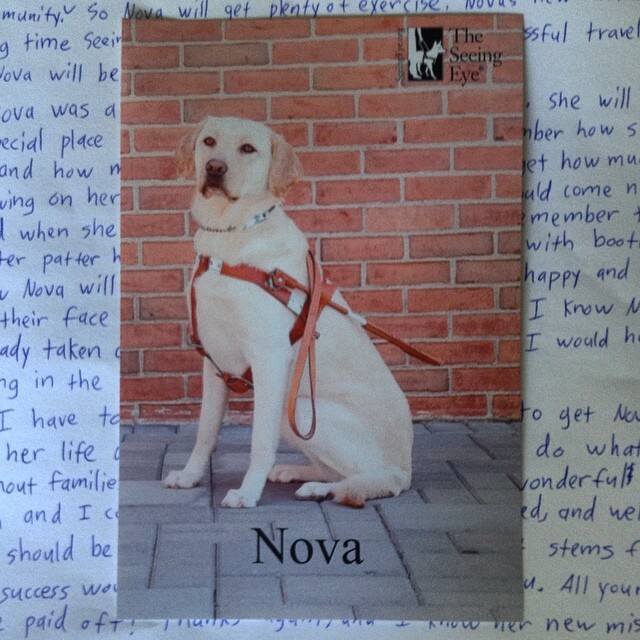 Since some of you may be wondering what happened to Nova after she returned to The Seeing Eye last November, I thought it was time for an update. While I anxiously waited to hear if Nova would pass her preliminary tests and be placed with a trainer, her mom, Carey, was busy with a litter of new puppies (more on that in a minute). In the beginning of January, after what felt like an eternity, I finally heard that Nova was placed with a trainer. She sent me an update by postcard. In April, my family and I were invited to her Town Walk, the graduation ceremony where she showed all that she learned in her months of harness training. Nova passed (!) but honestly, there was no doubt in my mind she would make the program. Nova went into the May class to wait for her human match. The Seeing Eye’s program is similar to college; The Seeing Eye is the campus and the blind humans are the students. Classes are composed of students and canine guides waiting to be paired. 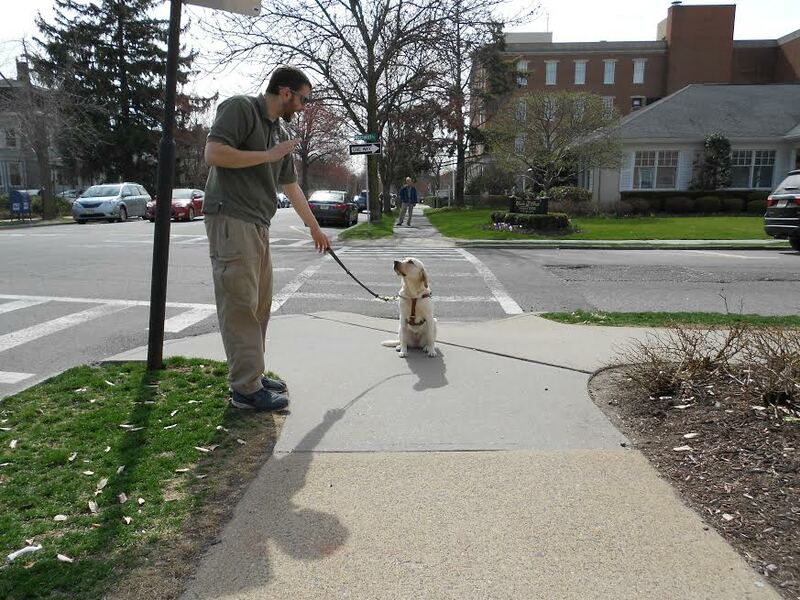 Every month a new class goes to The Seeing Eye’s campus where they enter into a class with students and stay on campus in dorm-style rooms for about thirty days of training with their canine match. 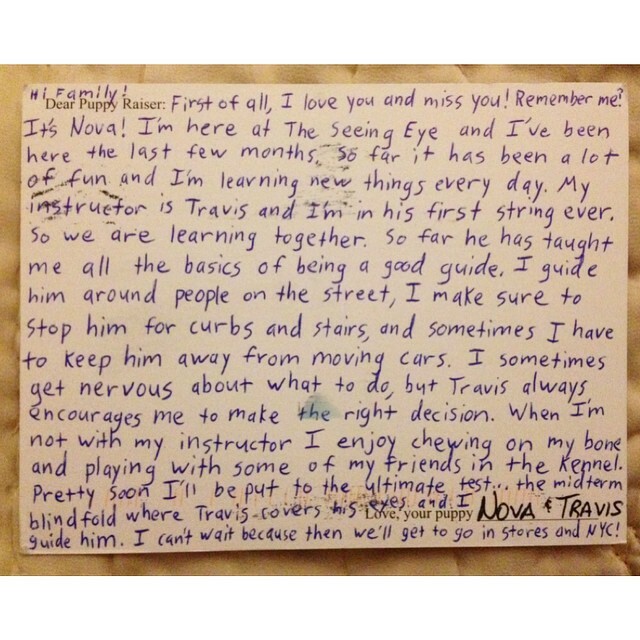 In June I received a letter; Nova met her match in the May class. She met her blind best friend for life! I cried the happiest of tears. I am still completely overjoyed. Nova “rests” and poses for pictures at the completion of her Town Walk. As I mentioned earlier, momma pup Carey has been busy. 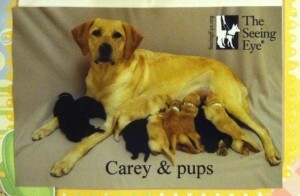 She had a litter of nine puppies on Christmas Eve: another “N” litter. Nellie is hidden somewhere in the puppy pile. 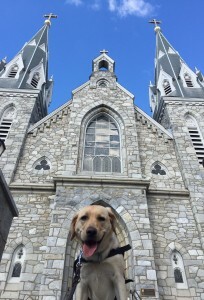 Nellie poses in front of St. Thomas of Villanova Church. Just before Valentine’s Day, I welcomed seven week old Nellie into my life. Just like her half-sister Nova, Nellie will spend 12-15 months with me learning and growing. You may have already seen her around campus; she usually makes a weekly visit. Here are a few helpful tips for when you come across a working dog: Do not call the guide dog’s name, make eye contact, feed or talk to a working dog in harness. It is always best to treat the dog as if he is not there. Do not pet a guide dog when he is wearing the harness. If the dog is resting without his harness, ask the owner before you pet the dog and respect the person’s decision if they say no. As a general rule of thumb, please be sure to always ask the human handling the dog, whether in a vest or harness, if it is okay to pet, interact with or even speak to the dog. If you are interested in learning more about The Seeing Eye or puppy raising please visit The Seeing Eye’s website. Come out to the 2015 Special Olympics Fall Festival—held the weekend of November 6, rain or shine. Stop by The Seeing Eye’s table, and meet the puppies in training.